What are the advantages and disadvantages of Internet Explorer? Internet Explorer is one of the most well-known internet browsers in the world, It comes installed on many Windows computers, It is faster with Windows computers because it is integrated, Some websites can only be used with Internet Explorer, It is universal, and some applications are optimized for IE. 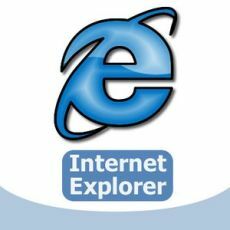 Internet Explorer is available for free, It has reached all the nations with internet connectivity, It is also present by default with any version of Windows operating systems, Some sites can only be opened specifically for IE and now Internet Explorer is still the most widely used browser worldwide. The versions 9 and above of Internet Explorer use HTML 5 which enhances browsing experience, This lets the user stream videos and audios exempting any requirements of installing additional plugins, IE being one of the oldest and conventional web browsers support a broad array of applications which some modern web browsers may not support. Internet Explorer aids in reopening the latest browsing sessions which the user might have accidentally closed, Some websites particularly businesses web pages, can only be viewed properly with Internet Explorer because of its previous large market-share. There are various special features in Internet Explorer that can help the users in viewing sites like the special accessibility setting where you can choose to ignore font colors, font styles, and font sizes particular web pages specifies for better viewing, or format web pages using a custom style sheet. Internet Explorer also has an attachment security service, where downloaded executable files are marked and the users are prompted to decide whether to trust the file or not (often times executable files are potentially unsafe). Internet Explorer can be set up with its Group Policy feature, in which the window server domains implement different kinds of settings involving the user interfaces, such as disabling menu items and individual configuration options, With Internet Explorer you still have the option of configuring your own policy setting. Internet Explorer has a peculiar cache of visited websites that can be found in your temporary internet files folder giving you quicker access to previously visited pages and the ability to view them while offline. Internet Explorer supports specific frameworks like ActiveX and VB support which are essential to the applications that range from e-learning simulators to web-based accounting programs which are important to many businesses’ sites. Internet Explorer provides adds on but not as much as Firefox, to look more simple, elegant and attractive, integrated with the Windows operating system, easy and not complicated in its operation, the display site and loading images more quickly and clearly. Internet Explorer is a full-featured web browser, developed by Microsoft Inc, in 1995, It is one of the most widely used and popular web browsers currently, Net Applications ranks “it as the first web browser based on the dimension of the user base”. Some people prefer Internet Explorer, Though Google Chrome, Mozilla Firefox and other intensely reliable, people may find Internet Explorer as a simpler, easier to use web browser due to its availability and ease of access, It is highly compatible with all versions of the most popular OS, Microsoft Windows and it exists in Windows by default. Internet Explorer has no add-on support, It slows down with the newer versions such as IE7, It may be less secure than the other browsers, It becomes buggy easily and it is targeted by the hackers. The users may face an issue regarding the speed of Internet Explorer, It is considered slower than Google Chrome in some regions, There are limited options for customization in Internet Explorer, Compared to Google Chrome and Mozilla Firefox. Internet Explorer offers fewer add-ons, extensions & plugins, The security implements on Internet Explorer still need to be improved, as it is a conventional web browser, phishing attacks and scam organizers target Internet Explorer the most. The users may find it less fascinating to stick to the same appearance of their primary web browser, Customization of toolbars is also quite limited on Internet Explorer, There is no track filtering feature in Internet Explorer, You cannot import or store a customized list of blocked websites. Internet Explorer often fails to read the script in some particular CSS websites, The security system is not optimal, there is no tab feature and speed in the open web quickly defeated by the other especially in the small bandwidth conditions, heavy when opening a new tab and start first.